Today I’m going to show you how to create your own body scrub at home in three simple steps. First of all, lets take a look at what you’ll need to make the face scrub. You will need some sugar to make up the abrasive, gritty texture of the scrub. Brown sugar is best to use because it is much more coarse than white sugar and it wont dissolve the way that granulated white sugar will. You’ll need a moisturising cream. I’m using a product called Steamcream* because it is such a multi purpose moisturiser that it is ideal for making a body scrub out of. You’ll also need something to mix it with- I’m using a cotton bud and lastly, you’ll need something to put it in- I’m using a Steamcream tin. 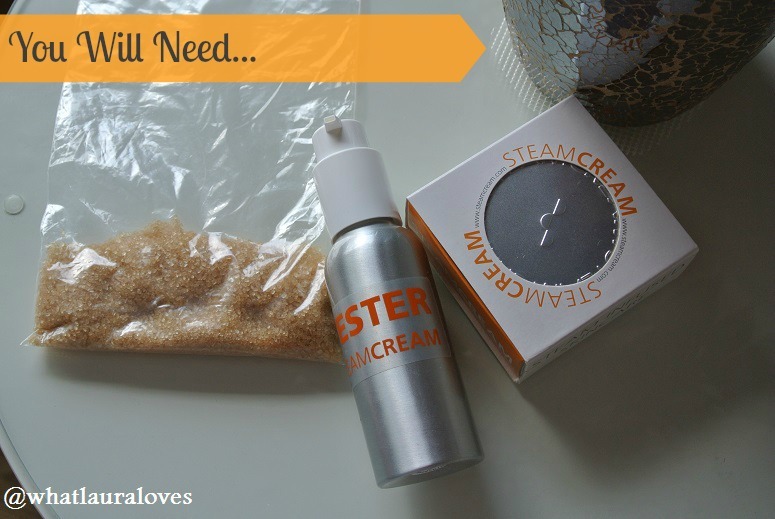 If you’d like to use Steamcream like I have, then it is available online and in store from Selfridges and John Lewis and it is available online from ASOS and from the Steamcream website for £12.95. I hadn’t heard of it until I was given a pot to try so I didn’t want to mention it without telling you all where you can get it from! The first step is to pour the sugar into the container that you’re going to be mixing the face scrub in. I opted to use an empty Steamcream tin as I could mix together the scrub in it but also store the scrub in it too. The second step is to add the Steamcream or moisturiser to the sugar. I’d really recommend using Steamcream for this over any old moisturiser because it contains ingredients that are going to help your skin while you’re using it. There’s neroli oil in there that will soften skin that is dry and hard and almond oil, Vitamin A and Vitamin E that will strengthen and nourish the skin. The next step is to simply mix the two together. There is no hard and fast rule as to how many parts sugar to how much Steamcream. I’d recommend adding a small amount, mixing the two together and if you think it needs a little more sugar then add it in, this will made the scrub more gritty and abrasive, but if you would prefer it to me a little more gentle and moisturising then add more Steamcream. Keeping going until you are happy with the consistency. I ended up using the full bag of sugar that I had above as I like my scrubs to be full of exfoliating particles. It is at this point that you could add essential oils to the mix if you so wish, so if there is something that you’re particularly working on with your skin then you could buy a little essential oil vial from somewhere like Holland and Barrett. For example, essential oils like bergamot, tea tree and calendula are great for those suffering from psoriasis. The Result: A gorgeous gritty body scrub! The result is a gorgeous gritty scrub that will slough away all of your dead skin cells and leave your skin looking revived and radiant and feeling soft and smooth! To use your body scrub I’ve recommend dampening your skin in the shower or bath, then shut off the shower head or let a little water out of the bath so that you’re not in the full flow of the water as this will dilute the scrub. Take a good handful of the scrub mixture and get to work on exfoliating your skin. I find that circular motions work the best to get rid of the dead skin cells that make your skin look lack lustre. I hope you enjoy using your new scrub as much as I enjoyed creating it! Let me know how you get on if you make this… see I told you it was super simple! What other ‘how to’ posts would you like to see me create?